This tutorial is aimed at getting beginners familiar more advanced concepts like data attributes and, at times, there will be more “efficient” ways of doing things, like creating advanced functions and optimising the output. However, as this tutorial is aimed at helping beginners, I’ll be taking a more procedural approach than some people might take. There is no right or wrong way here, there are simply more advanced and less advanced methods of getting the desired outcome. If you get stuck at all please leave me a comment below with a description of the problem and a link to a JSFiddle showing your code in action. I’m here to help, no matter what the problem. If you’re running a PHP powered site, like a WordPress blog, then it’s a good idea to put the code for the popup itself in the footer include file. This way you can always be sure the popup will be included on every page. 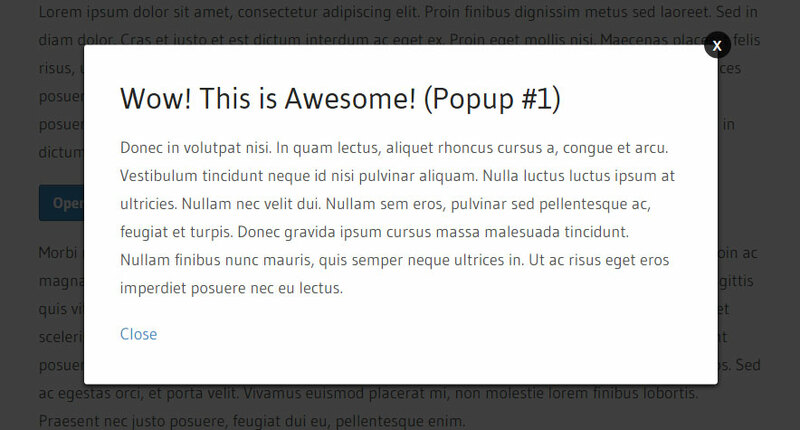 The structure of the popup is quite straightforward, so nothing to worry about there. 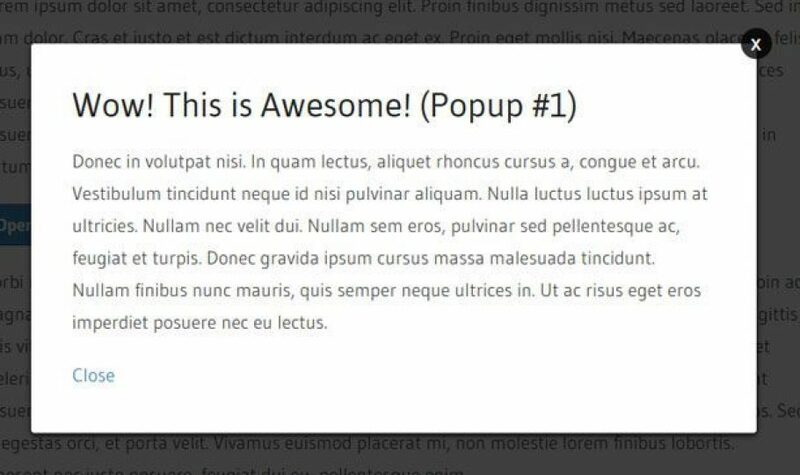 We start off with a wrapper div and give it a class of popup. This is the black background around the popup but also what we’ll animate with jQuery. You may notice those data attributes I’m using, for example data-popup="popup-1". The reason for using these is to make the code easier to use and maintain in the long run. Some people are advocates of using IDs in the same approach, however, this can become confusing as IDs are also commonly used for styling. The open button also uses a data attribute of data-popup-open="popup-1", which you may notice is the same value as the popup itself. This is handy because it will allow us to dynamically open the popup with jQuery. To close the popup there’s a normal anchor link and a specially positioned anchor link with data-popup-close="popup-1" applied to them. The good thing about using a data attribute on both links is that it allows us to have a special close button in the upper right of the popup, but also use a normal link inside of the popup to close it as well. The popup wrapper is using RGBA colour values to enable transparency, something a basic #HEX code can’t do. It also has fixed positioning, which makes it stay centred if the page is scrolled. The inner content area of the popup is absolutely positioned but also repositioned with transform. The absolute positioning moves the inner popup content left 50% and down 50%. The transform then moves it left -50% of its own width and down -50% of its own height. This then enables the inner popup to be exactly centred no matter what the size of the screen. The close button actually has a lot more styling rules than you’d expect. The reason it has a fon-family and font-size added is to make the popup work better across different projects. I highly advise using an icon font for the close button. For a good example, click the newsletter subscribe button at the top of the sidebar on this site. There’s also a transition on the button, this comes into play when you hover. On hover, the button is spun around 180 degrees. If you put 360 degrees it will actually not look any different so 180 is what’s needed for the desired spinning effect. That’s it for the CSS. If you’ve got any question on what we covered so far, please leave me a comment below. Do you remember those data attributes from the HTML? This is where they come into play. We first set up a click event on any of the open buttons and stop the default behaviour, which in this case, would be to follow the link. If we don’t use e.preventDefault(); to stop the default behaviour, a # will be added to the URL in the address bar. The next step is to grab the value from the attribute and save that information to a variable. The value saved will be whatever has been added to that buttons attribute data-popup-open. In our case, the output will be popup-1. Now comes the fun part, fading in the popup. The code below might look pretty scary but really, it’s quite simple. All it says is “find the popup with a data-popup value of popup-1 and fade it in for 350 milliseconds“. Also, because we’re using a variable, it saves us from having to repeat the open functionality for each popup we create, as it’s dynamically found and used. Closing the popup is actually just a reverse of opening it. Instead of looking for the value of the open button we’re looking for the value of the close button. We’re also fading out instead of fading in. Custom popup modals can be incredibly powerful, but also far more annoying if used incorrectly. When implementing your popup modal please don’t have it to autoload. This is a big problem as it will cause people to never return, even if you remove the popup because there only thought of your site and brand is an annoying popup the second they open up some of your content. Help and support: If you have questions and/or need help with any code, please leave a comment below with a link to a JSFiddle showing your code in action. You might also like: Tooltips in HTML and CSS. Excelent! This was a very useful example for me. Thanks. Where did you get the “active” class from as it’s not in the css? the popup is not popping up as it suppose to…. I think the code might have an error… could you assist me?? How can I adapt this to where when you click outside of the modal (the transparent black background), it closes the modal just like the X button does? How can I adapt this so that when the transparent black background div is clicked, it closes out the modal like the x button does? Great code, works perfectly on some browsers. However, the modal popups don’t work on firefox? Is there additional code to work around this? No asking questions for you. Just use the code as is. How can I make the modal close by clicking outside it? I saw after I posted my question you don’t recommend the modal show up on page load. This is how we’ve implemented it in the past, but we’re switching from Coldfusion to PHP. Sorry for asking the question before I saw your comment about it. how to show a modal window or pop-up window after submitting contact us form? Neat and clean tutorial and explanation. Great post a good basis for developing something further. Wow! This was actually pretty easy. Thank you for taking the time to explain. How to access angular js scope values in this modal? i have a video playing in the popup, when clicking on the X to close,, i need to pause the video and then close. how can that be done? This will allow clicking anywhere on the background (except the dialog itself) to close the dialog. This tutorial is great, i have been your follower Seb and I see you have written great guides. I was wondering will it be possible to add some translation in this model with css only like we see in jquery based models where they appear from right or fade away to right. This is just an example. Jquery is a pre-req for this code. how to close the pop up on clicking outside?? Excellent tutorial, thank you so much! I recommend adding z-index: 999; to .popup. That’s the only change I had to make. Thanks for this tutorial it is very helpful. But there is a problem with it when it comes to mobile devices the content is chopped of on the top and bottom and there is no way to close it. I think it is not responsive. Hi, I followed your instructions exactly, and they all worked (thanks a lot!) except strangely for the very last element. So I’m generating a bunch of buttons dynamically in jQuery, then attach the required classes and data attributes as you mentioned, along with your event handlers. All of them work and produce the pop-up, except the very last one which always seems to ignore the e.preventDefault(), and instead just adds the ‘#’ link in the URL, and doesn’t bring up the pop-up. Do you know why that’s the case? where shuld i put the code? do i need the all 3 code or can i use only html? This tutorial helped me a lot so thanks. Can you tell me how you’d modify the code to also close the modal window on pressing the esc key or clicking outside the modal window please. The Create a Fading Popup Modal with jQuery, was a good example to apply with buttons specially when to explain about the concept. I tried to fellow you instruction of the codes, but fail to make the pop up work. Do you have the complete codes to test it and play with it. Many thanks for your help. Great tutorial! I would like to incorporate in a website I manager for a nonprofit. I have the board of directors page with their photos and I would like a popup to be shown with the individual’s bio when their image is click. I tested it in liveweave.com and it works great but can someone explain how to use it in a wordpress site? The link to Fiddle is not working, it seems to be pointing to no snippet but landing page of JSFiddle. The popup is showing under other elements. I have tried changing the z index and also making it relative. Hey, thanks for tutorial – it’s great and simple. Could you please add a line of code, so I can click anywhere on black in order to close popup? it is kind of a usual UX thing, I guess. I am wondering if you know if this will work with Squarespace sites given their structure. I cannot believe I cannot find a player that does not go full screen (using the grid layout in SS). It dominates the site with the video and at the end does not reduce or go away so the user must “x” out to see the site itself. Any help for a non css/JQuery guy. Really awesome tutorial. I can’t wrap my head around how the data attributes work. If one were to use id instead, how would one do, just in comparison? I would really like to get the full understanding of this great example. I found this article accidentally and found it very useful. Just wanted to add to this article that the best practice would also be to add z-index:999 to a class .popup as than the bg will cover all other elements and popup will be in focus. I like the popup modal. I was wondering if this will work outside of Word Press? I am creating just a standard website with a folder call JS and CSS for the style sheet. The style sheet is Styles.css. It appears that the html, css, jquery is to be put into one page, I couldn’t get it to work. Any ideas on what to do to create a .js, do I need to name it something specific? on the html, do I just create a simple html with no head or title or body? Do I save it out to popup-1.html or is it supposed to go into the already written html? Can I put the CSS you have in my existing Styles.css? I would like to get it working but I am not experienced enough yet to know how to structure it into my site fully. thanks for any help! Hi bro ! , thanks for the post. It works great.The only thing is that the video keeps playing after you close the popup. Ineed that the video stops , when i close the pop up.Is there any way to do that ? Thanks ! I’m using Squarespace (Pacific theme) and the problem I am having with this is that the modal shows up, however the rest of the content on the page overlaps the popup – in other words, if you think of the page as layers, where the modal should be the top layer, it’s actually kind of showing up as a layer UNDER the rest of the page content. Hope that makes sense. Just put the html in the footer (as you suggested!) and it’s perfect! I’m using Squarespace too, but can’t seem to get this to work. Where do I place the codes. CSS, I know. But JQuery and HTML, no idea. I don’t understand “put the HTML code in the Footer” when I want the popup to show when a text in the body is clicked, not a text in the footer. Please help. Thank you very much! so help me by answering my simple ques. Very good tutorial again !!! can i use it like a wordpress plugin? is there a zip file to download? There isn’t currently a download for the code above, but I’ll see what I can do about adding one. as I can download “Create a Modal Popup Loading with jQuery” ?? I never comment on things, but in the modern day web, you would most definitely not use jQuery alone with animations. NO! We have a non CPU hogging animation system. It’s called CSS3! Add a class and do your magic! I agree, CSS3 animations are the way forward. However, as I explain in the beginning of the tutorial, it’s aimed at beginners and I do state there are better ways to go about this. I’ll make it more clear in future tutorials.